All fetatrack® products are supplied with a standard 3 year warranty, lowering the cost of ownership. With over 25 years of supplying fetal monitors you can be assured that any problem your fetatrack®310 unit will encounter over its lifetime will be fixed quickly and reliably. 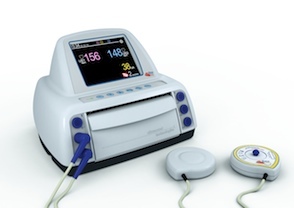 The fetatrack®310 offers continuous fetal monitoring in the antenatal clinic or labour wards. The fetatrack®310 has all the necessary facilities for accurate antenatal fetal assessment in one cost effective and compact unit. Fully integrated digital transducers allow you to choose the mode of operation you require, from single fetus to twins or even triplets. Standard on the fetatrack®310 is the external toco transducer and hand held event marker, providing a means of patient indicated fetal movement. Contoured transducers are less obtrusive and greatly aid patient comfort during extended monitoring sessions and are designed to aid correct placement. High resolution multipoint digital autocorrelation provides accurate and reliable FHR traces. Operators can be assured that they are getting the best, most reliable signals and a distinctive alert warns when heart rate is out of range. There is no loss of data when the paper runs out, as the unit will store the traces until a new pack is installed. The user is alerted with an audible and visual signal.